For a unique holiday wreath, consider a living wreath you can enjoy throughout the year. These make beautiful gifts and are a fun project for the entire family to enjoy. Soak the sphagnum moss in water for 1-2 hours. Gently squeeze the moss to remove excess water. Pack and pat the moss into the bottom and sides of the form, covering the bottom and side wire to create space for the soil. Add slightly moistened soil between the moss walls, leaving the surface approximately one inch below the top of the form. Remove the plants from their pots and arrange them on the form. Try several arrangements to find the one you like best, taking care to balance plant sizes and shapes around the wreath. Using a spoon, dig holes and plant. Cover roots completely while planting. Cover the exposed soil with additional moss and tuck moss around the plants to retain the soil. This can also help cover any root tops that may still be exposed. If needed, wrap the form with floral wire to help hold the plants in place or add additional stability to the arrangement. Water the wreath and keep flat for two weeks to establish the plants and allow their roots to gain purchase. Until spring temperatures are in upper 40s, hang indoors in a bright or sunny location. During the holidays, use as a flat centerpiece surrounding candles with evergreen cuttings and pinecones. Hang it on the wall as a “picture frame” around prior holiday pictures or a small mirror. You could even frame an advent calendar or picture of Santa Claus! Between the holidays and spring, water weekly by misting. (You may need to move to a sink for watering). Fertilize every other month by mixing half-dilution of liquid fertilizer into the watering mist. In spring, move outdoors and hang in a bright but shaded location to prevent burning. Higher temperatures require more frequent watering. Continue to fertilize every other month. Consider using shells, pinecones or other items to add depth and interest. For holidays, wrap a portion with colorful ribbon or insert short thin rods with ornaments or seasonal figures into the soil. 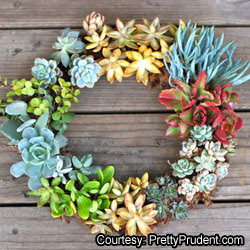 Succulents with low watering requirements are popular for wreaths. Available in a variety of colors and textures, plant the wreath with just one variety or use an assortment for a completely different look. Use Epiphytic (“air plants”), bits of driftwood and shells for an ocean appearance. Our garden center has many sizes and styles of forms, plants and other materials to meet your needs. Come on in to see us and get your decorating on!